Citation SCUTELLARIA OVATA Hill, subsp. BRACTEATA (Bentham) Epling, Univ. Calif. Publ. Bot. 20: 52. 1942. 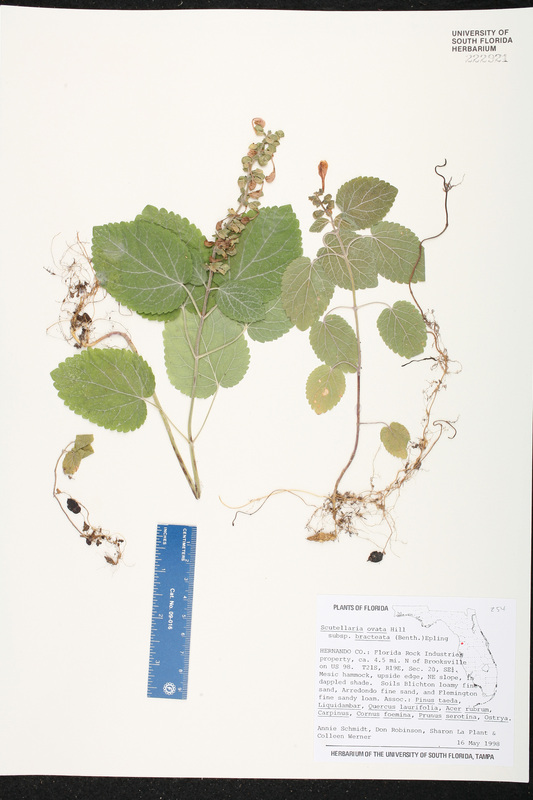 Basionym: Scutellaria versicolor Nuttall, var. bracteata Bentham 1834. Type: TEXAS: Austin Co.: Rio Brazos, 1833, Drummond s.n. (holotype: K). Scutellaria cordifolia var. 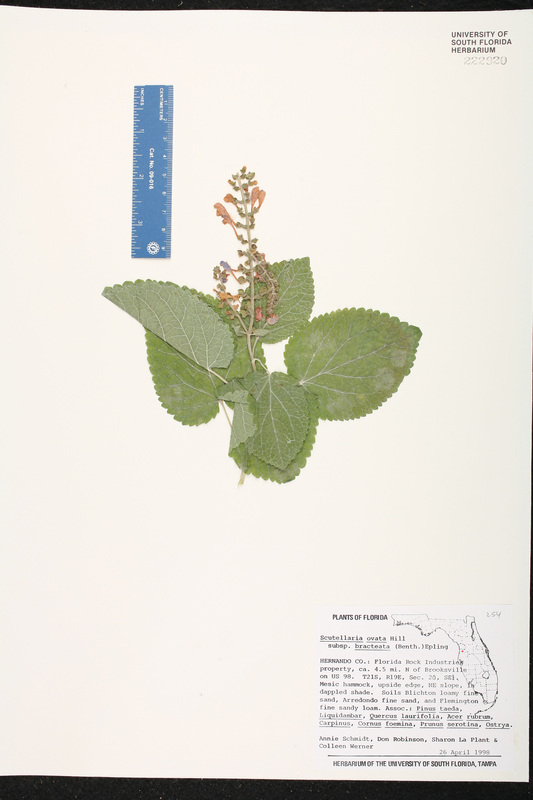 bracteata Scutellaria cordifolia Muhlenberg ex Bentham, var. 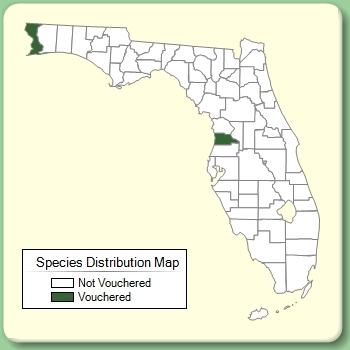 bracteata (Bentham) Small, Fl. S.E. U.S. 1021. 1903. BASIONYM: Scutellaria versicolor Nuttall, var. bracteata Bentham 1834. Scutellaria ovata var. bracteata Scutellaria ovata Hill, var. bracteata (Bentham) S. F. Blake, Rhodora 17: 134. 1915. BASIONYM: Scutellaria versicolor Nuttall, var. bracteata Bentham 1834. Scutellaria versicolor var. 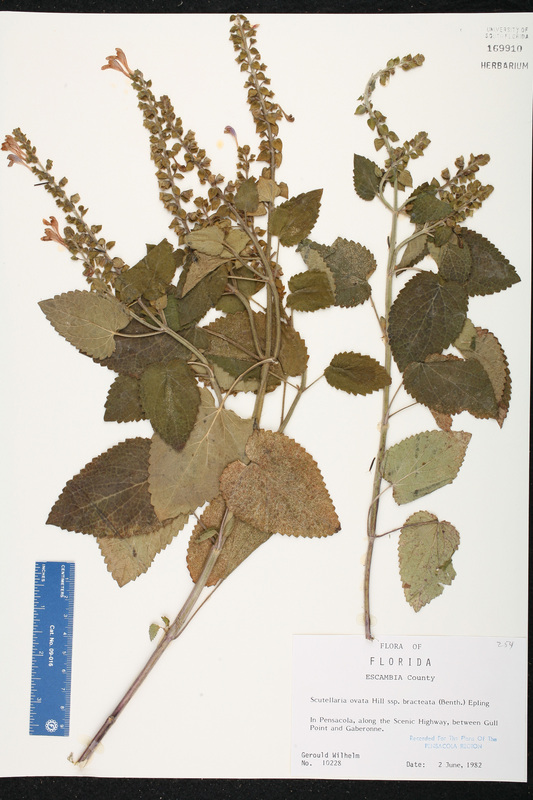 bracteata Scutellaria versicolor Nuttall, var. bracteata Bentham, Labiat. Gen. Spec. 433. 1834. TYPE: TEXAS: Austin Co.: Rio Brazos, 1833, Drummond s.n. (holotype: K). Scutellaria cordifolia var. 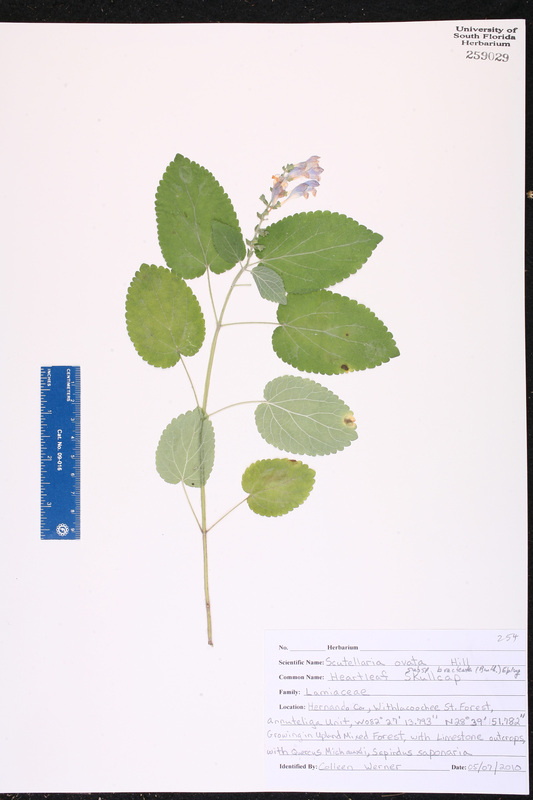 pilosissima Scutellaria cordifolia Muhlenberg ex Bentham, var. pilosissima Mackenzie & Bush, Trans. Acad. Sci. St. Louis 12: 84, pl. 15. 1902. TYPE: MISSOURI: Barry Co.: Eagle Rock, 24 Jun 1897, Bush 190 (holotype: MO; isotype: NY). USA Florida Hernando Co. 16 May 1998 A. C. Schmidt s.n. USA Florida Hernando Co. 26 Apr 1998 A. C. Schmidt s.n. USA Florida Hernando Co. 07 May 2010 C. Werner s.n.